Also new is added support for using Messenger with multiple accounts – a feature designed for those who shared devices. As the blog Android Police noted, some users were seeing a new SMS Settings pane that allowed them to use Messenger as an SMS client. At the same time, Facebook pulled the option to actually send out SMS messages, saying that the feature had seen “low traction.” In reality, the company likely wanted to force Messenger adoption – something it did very well, also by pulling the functionality from the default Facebook app in 2014. The fact that Facebook may now be considering bringing SMS support back to Messenger lines up with the company’s previously announced vision statement for 2016, which included plans to make the phone number disappear, the company had said. As TechCrunch’s Josh Constine pointed out at the time, Messenger is so far ahead of other messaging apps in the U.S. that its only real competition is SMS and iMessage. To date, the company has already made several big strides to help transition people away from using their phone’s native texting app, including the launch of a feature that let anyone send a message request to anyone on Facebook, which eliminated the need to know someone’s phone number. “Message requests,” as the feature is known, brings privacy to the mobile messaging experience, too – while you can view these requests along with more information about the sender in your Filtered Requests folder, the message’s sender never knows if you looked at their message. However, to truly kill off SMS, it seems that Facebook may have realized that it will (once again) have to allow people to use Messenger as their SMS client. All the bells and whistles – including GIFs, photo and video support, voice calling, hidden chess games!, etc. – are not enough if your friend doesn’t have the app installed. You’ll probably still just text them. Turning a mobile messaging app into the default SMS client is something that Google has also done on Android, of course. However, it’s been backtracking on its implementation in recent days. The company’s SMS-integrated Hangouts app has been asking users to switch back to Google’s regular SMS app instead, users have noticed. At Messenger we are always trying to create new ways for people to communicate seamlessly with everyone. Right now, we’re testing the ability for people to easily bring all their conversations – from SMS and Messenger – to one place. It’s a really simple way to get, see and respond to all your SMS messages in just one app. By choosing to access your SMS messages in Messenger, they’re right alongside all the other enhanced features that Messenger offers. SMS support is not the only change coming to Messenger – Facebook also announced support for multiple accounts in the app. 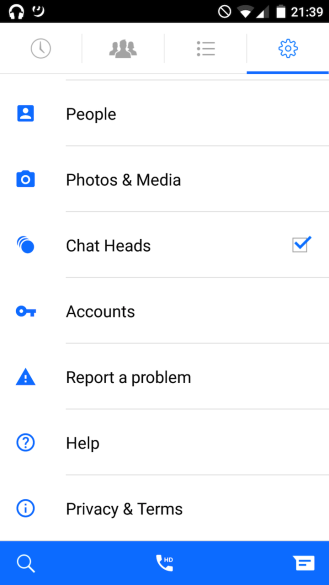 Now Messenger for Android has a new section called “Accounts,” which lets you add and remove accounts on the app. These can also be password-protected so only the account holder can read their messages. Others will only see notifications that a message has been received – not its content.